The ISI Skating Program was developed more than 50 years ago and has become the program of choice for successful coaches and skating schools wishing to increase participation and improve skater retention while keeping skating fun! It is based on consistent and well-defined levels of achievement that have proven to guide a skater from basic beginner maneuvers through significantly more advanced and even competitive skill sets. It has literally taught millions of people how to skate and skate well. Many of the most accomplished skaters in the United States began in this program and have gone on to achieve some of the world’s highest titles. Encourages individuals to skate for FUN and enjoyment! Supports success by offering easily attainable testing levels for all ages and abilities. Offers opportunities for skaters to participate in exhibitions, shows, and in local and district competitions in many different event categories. Provides an opportunity for participation in at least five national/international ISI competitions each year in various locations across the USA which are open to all ISI members worldwide. These levels are specifically designed for beginning skaters age 6 and under. Test maneuvers are broken down into smaller parts so they can be easily learned and mastered. Fun – along with easy success and accomplishments – are the keys to any Tot level class. These beginning levels are for skaters of all ages. Step-by-step progression of skills makes learning fun, and fast! Once the skater begins to build on the basics, the sky is the limit! It’s important to master these skating “basics” before moving on to higher levels of achievement. This is the hottest new addition to the program and opens up many more opportunities for skaters at all Freestyle levels. It’s great for USFS skaters who wish to compete in local, district or national ISI events; current ISI skaters who might be stuck between levels but still want to advance while performing new maneuvers; and adult skaters who might not be strong enough on a required maneuver in the traditional Freestyle 1-10 test levels but still want to advance and compete. These beginning levels are for special needs skaters of all ages. Step-by-step progression of skills makes learning fun, and fast! Once the skater begins to build on the basics, the sky is the limit! It’s important to master these skating “basics” before moving on to higher levels of achievement. This special partnered discipline incorporates side-by-side freestyle test maneuvers which are tested and performed simultaneously by two skaters. Hockey provides young and old alike the opportunity to use the skills they have mastered while getting in shape and enjoying the chance to participate in a competitive team sport. Ice Dance includes a variety of options for the skater from traditional pattern dances to free dances that can be skated as a solo, mixed partner, similar partner, pro partner, etc. Testing of these dances are done individually and skaters are permitted to compete them as they are achieved without having to complete a full dance level. The ISI Program offers synchronized skaters and teams of all abilities and ages an opportunity to participate in events and shows as well as to compete against teams of similar skill sets. 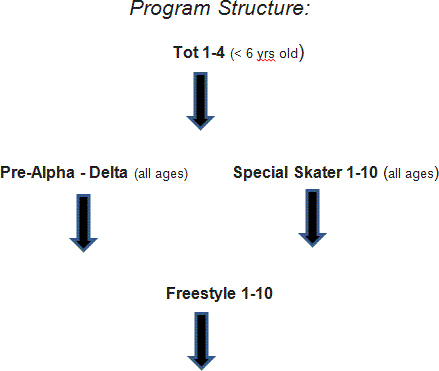 These levels range from the very basic skating skills (Formation) through levels with more difficult turns and edges ( Advanced Formation) to the most skilled (Skating) Teams are grouped by ages and no tests are required for participation on any teams.